Android: 5fish는 5,500개 이상의 언어로 복음 메시지, 성경 이야기, 가르침과 노래의 시청각 레코딩에 액세스 할 수 있게 해 줍니다. 화면에서 주요 앱화면으로 가기 위해서는 메뉴 아이콘 을 누릅니다. 은 3개의 주요 옵션 즉 언어 및 국가별로 그룹화된 레코딩을 찾기 위한 내용 추가 , 콘텐츠를 보고 관리하기 위한 My Library 그리고 이 있습니다. 어떻게 찾고, 다운로드, 재생 및 레코딩을 공유하는 방법에 대한 자세한 내용을 다른 도움말 항목에서 보세요. iOS: 5fish allows you to download and listen to audiovisual programs of Gospel messages, Bible stories, teachings and songs in more than 5,500 languages. On the screen, tap on the menu icon to navigate to any of the main app screens. The screen also contains the 3 main options 내용 추가 for browsing through available programs grouped by language and country, My Library for viewing downloaded content, and . Have a look at other help topics to read more about how to find, download, and play programs. Android: 가능한 모든 레코딩을 찾으시려면, 또는 메인 메뉴에서 내용 추가 을 선택하세요. 검색은 언어별 레코딩 그룹 및 국가별 언어로 그룹화 되어 있습니다. 국가를 선택-리스트 목록 또는 국가이름을 입력하기 시작함으로써 검색 기능 을 시작 그리고 이 나라에서 사용하는 언어 중 하나를 선택합니다. 선택한 언어로 제공되는 레코딩의 목록을 볼 수 있습니다. 내용과 다운로드 크기에 대한 정보를 볼 수 있는 레코딩을 선택합니다. 각 레코딩은 여러개의 트랙으로 구성되어 있고 개별적으로 또는 모두 선택하여 다운로드 할 수 있습니다 . 다운로드 된 트랙은 장치에 저장됩니다. 검색에서 선택한 국가의 언어 목록은 기본설정을 조정할 수 있습니다: 비 원주민 언어를 목록에 포함하거나 각 언어의 대체 이름을 표시하거나 리스트에서 언어 이름 다음에 언어샘플의 가용성을 표시하려면 메뉴 를 이용합니다. 샘플 청취를 시작하시려면 언어 샘플을 누릅니다. iOS: To find out about all available programs, select 내용 추가 on the screen or from the main menu. The 검색 has options to search for programs via program language or the country where the language is spoken. For example, select to see a list of all countries with languages that have GRN programs available. Select a country by swiping through the list or by typing the country name in the search box . Then select any language spoken in the country to see a list of available programs for that language. Select a program to see information about its content. Each program consists of a number of items which can be selected individually or all at once for download. Downloaded items are stored on your device; each program with at least one downloaded item will appear in My Library. Notice that the list of languages displayed for a chosen country in the 검색 indicates the availability of language samples next to language names. Tap on the language sample icon to start listening to the sample. 5fish가 좋으시면, 당신의 친구와 함께 앱과 레코딩을 공유 할 수 있습니다. 녹음을 공유 할 수있는 하나의 장소는My Library(녹음별로 그룹화) 화면입니다. 레코딩을 길게 누르고 상단의 공유 아이콘 을 누릅니다. 레코딩의 다운로드링크를 공유하거나 오디오 파일 자체를 공유할 수 있습니다(당신이 당신의 장치에 그들을 다운로드 한 경우). 이메일, 페이스 북이나 메시징 등 공유 할 수있는 다양한 방법중에서 선택합니다. 당신은 또한 메인메뉴에서 앱 공유 를 선택함으로써 5FISH앱을 공유할 수 있습니다. 또한, 공유는 다운로드 링크 또는 응용 프로그램 파일 자체, 그리고 공유 할 수있는 여러 가지 방법 중 하나를 포함 할 수 있습니다. 응용 프로그램 파일을 공유하시려면, 먼저 GRN 서버에서 5fish앱 파일 다운로드 버튼을 눌러 다운로드 받으세요. Android: 레코딩 트랙이 장치에 다운로드 되는 즉시 언제든지 재생할 수 있습니다. 재생을 시작하는 한 가지 방법은 메인 메뉴에서 다운로드 관리 을 선택하는 것입니다. 당신은 레코딩의 목록과 다운로드 트랙 수를 나타내는 각각의 기록을 볼 수 있습니다. 포함된 트랙의 개요를 볼 수있는 레코딩을 선택합니다. 개별 트랙이나 다운로드 한 모든 트랙 재생을 을 누름으로써 시작합니다. 트랙을 재생하는 동안 5fish플레이어의 확장 또는 축소보기를 할 수 있습니다. 확장된 뷰는 전체 화면으로 재생되는 트랙 내용의 이미지를 보여줍니다. 상황에 맞는 메뉴 를 사용하여 트랙리스트보기 모드 및 스크립트보기 모드 또는 상단에있는 아이콘을 탭 하여 전체 화면 모드로 전환합니다. 5fish 플레이어의 축소보기는 재생하는 동안 다른 일을 할 수 있게 해줍니다. 친구가 당신과 함께 GRN 레코딩을 공유하거나 당신이 GRN의 웹 사이트 중 하나에서 직접 레코딩을 다운로드하는 경우 응용 프로그램 내에서 당신이 확인하고 재생할 수 있도록 5fish로 가져올 수 있습니다. 메인 메뉴로부터 GRN레코딩 불러오기 를 선택합니다. 다음 화면에서 5fish를 가져올 레코딩을 위치를 결정한 다음 가져오기 시작을 누릅니다.가져 오기 프로세스가 자동화됩니다. 이것이 완료된 후에는 My Library에서 새로 가져온 레코딩을 볼 수 있습니다. Yes. GRN encourages users to share the programs, for example by selecting 링크 공유 from the context menu on the screen that shows the details of a program (after selecting the program in My Library or on the 검색 screen). Read GRN's terms and conditions (globalrecordings.net/terms-and-conditions) for more information. Audio stored on external storage can be played in the 5fish app after importing using the GRN레코딩 불러오기 function found in the main menu. After selecting a Jesus Film program from the Global Library or My Library, tap the play button to begin watching the program. Jesus Film programs require internet access unless they have been downloaded to your device. While viewing a Jesus Film program in the Global Library or My Library, tap the download button . Then select the quality to begin the download. While viewing an audio Bible from the Global Library or My Library, tap the Play button to start playing the audio Bible. 5fish will play the current book and chapter from the internet if audio for that book and chapter has not been downloaded yet onto your device. Audio Bibles require internet access unless they have been downloaded to your device. To change the current audio Bible book and chapter, tap on the area displaying the current audio Bible chapter and follow the prompts. 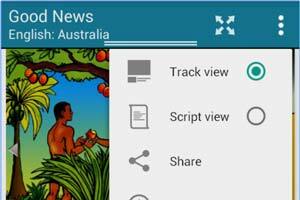 While viewing an audio Bible, tap the download icon to download or manage your content. The download icon appears for audio Bibles with downloadable content. Which audio Bible content can I download? Some audio Bible text and audio can be downloaded for offline use. To share an audio Bible link, tap on the context menu for the audio Bible in My Library and tap on "Share link" to share the link for that audio Bible. 5fish는 당신이 가장 관심이 있는 언어와 레코딩을 My Library 에 추가함으로써 쉽게 관리하게 해 줍니다. 검색 화면에서 상단에있는 아이콘을 탭 하면 이 언어에서 사용할 수있는 모든 레코딩을 라이브러리에 추가합니다. 개인 레코딩을 관리하려면, 상황에 맞는 메뉴 를 사용하여 레코딩을 즐겨찾기 에 추가합니다. My Library 화면에서 상단의 드롭 다운 메뉴를 이용하여 개인 레코딩, 언어 또는 레코딩 범주별로 그룹화 라이브러리의 콘텐츠를 볼 수 있습니다. 컨텍스트 메뉴를 사용하여 정렬 순서 결정, 즐겨찾기의 보여지는 레코딩 수 제한 또는 적어도 하나의 다운로드된 트랙 보여지기 등 다른 뷰 모드로 전환 할 수 있습니다. 언어별로 그룹화 된 라이브러리의 내용을 볼 때, 언어를 누르고 상단에있는 아이콘을 눌러 라이브러리에서 언어를 제거합니다. To remove a language from your personal library and delete all downloaded contents in this language from the device, select My Library from the main menu, view library contents grouped by language (i.e. select 언어 from the drop down box at the top), long press the language that you would like to delete, and tap on the delete icon . Alternatively, while viewing a single language in 검색 or My Library, tap on the top icon to remove the language. The contents listed in My Library are based on a set of included languages. A language is added to the library manually by tapping on the top icon on the 검색 screen (after selecting the language), or automatically when downloading any contents in this language. For all included languages, the library always lists all available programs, no matter if those programs have been downloaded on the device or not. Deleting a program (e.g. by selecting 오디오 삭제 from the context menu on the screen that shows the program's details) will delete all its downloaded tracks from the device but the program itself will still be listed in the library. Programs will only be removed from the library once their language is removed. To remove a language, tap on in the library (when viewing contents grouped by language) or on the 검색 screen (after selecting the language). All downloaded contents in this language will be deleted from the device, and the programs of this language will not longer be listed in the library. 사용자 정의를 위해서는 주 메뉴에서 세팅 을 선택합니다. 다운로드, 재생 및 다른 주제에 대해 설명과 함께 설정의 목록을 볼 수 있습니다. 당신이 좋아하는 방식으로 5fish를 작동하시려면 설정을 누르세요. The 5fish app allows you to store audio files on any external storage connected to your device. If your device contains both primary (emulated) and secondary (SD card ) external storage you will have the option to store audio files on your SD card instead of your primary storage area. The option to do this is contained within the 세팅 of the 5fish app. Select 검색 from the main menu or tap on the icon at the top of the 홈 screen to search for locations, languages, programs, categories, tracks, and scripts. Start typing letters into the search box at the top to retrieve all search results containing the typed text. The search results include all locations and languages that 5fish has programs in. Names of programs, categories, and tracks, or words in scripts will only be searched for the languages added to My Library . A number of app screens offer the option 여러개 선택 in their context menu to perform certain actions on multiple items at once, such as: • Deleting , sharing or copying programs listed in My Library or on the 검색 screen (the delete option will not remove programs from the library but will delete all their downloaded tracks from the device; the copy option is only available for a single selected program and stores its download link in the device's clipboard) • Removing or sharing languages listed in My Library (removing languages will delete all downloaded programs in these languages from the device and remove the languages from the library) • Deleting categories of programs listed in My Library (deleting categories will not remove them from the library but will delete all downloaded programs in these categories from the device) When in multiple selection mode, tap on individual elements to select or deselect them. The number of selected items and the possible actions to trigger are indicated at the top. You can return to normal mode by tapping the back button or by deselecting all items. Any screen that shows a list of programs in My Library or via 검색 offers an option 정렬 in the context menu to change the sort order of the programs. Sorting by 즐겨찾기 will place any programs marked as favourite at the top of the list. Sorting by 최근이용프로그램 will place your most recently accessed programs at the top. The 추천 sort order will sort the programs in the order GRN recommends they be listened to. Note that when you are using the 그리드 보기 mode then the only supported sort orders are 언어 이름 and 종류 . Selecting any other sort order will automatically change the view mode to 리스트 보기.